Grease and flour two baking sheets. Sift together the flour, baking powder and cocoa powder in a large bowl. Add the sugar, ground almonds, almond essence, mixed spice and ground cloves. Mix everything well and then add the candied cherries and the orange and lemon zest. Mix again and then add the orange blossom water and the golden syrup. Carefully add just enough water, little by little, to get a doughy mix which is not too dry or soft. You might need more (or less) than 9 tablespoons. Preheat oven to 190 degrees Celsius. Wet your hands with water and shape the dough into a sausage shape. 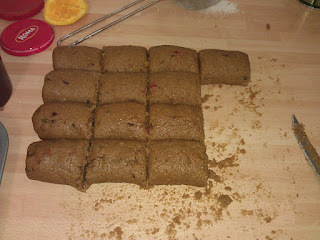 Cut evenly into 12 parts, place on the baking sheets and flatten slightly. Leave some space in between them to allow for spreading, as they double in size. Score the tops lightly with a knife in diagonal lines. Bake in preheated oven for exactly 23 minutes for the large ones, or 17 minutes for the smaller ones. 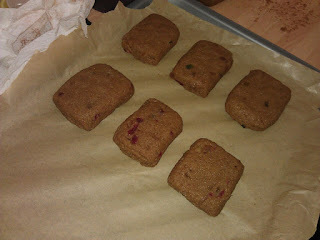 They will still feel a bit soft, however the edges will be slightly browned. 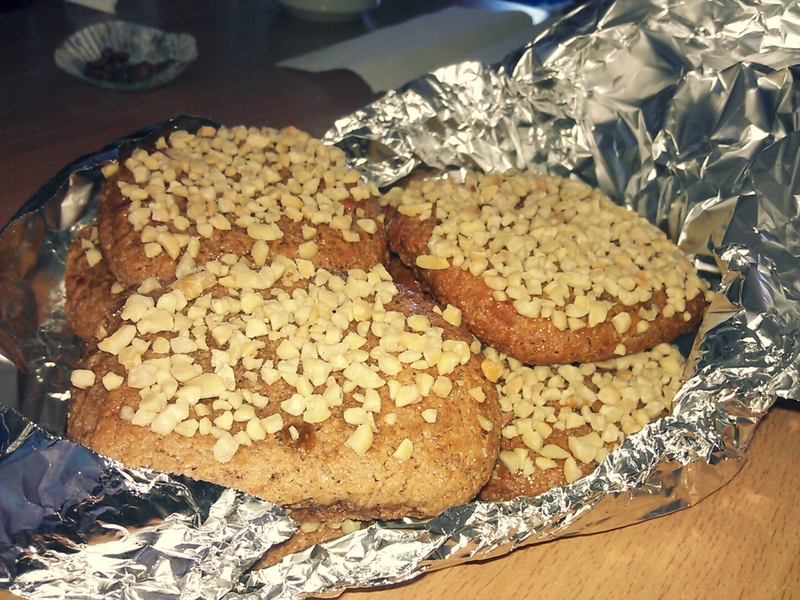 Take them out and cool on the baking tray for 2 minutes. Then remove and cool on a rack. While still warm, spread the tops of the kwarezimal with the golden syrup, then sprinkle with the chopped almonds.